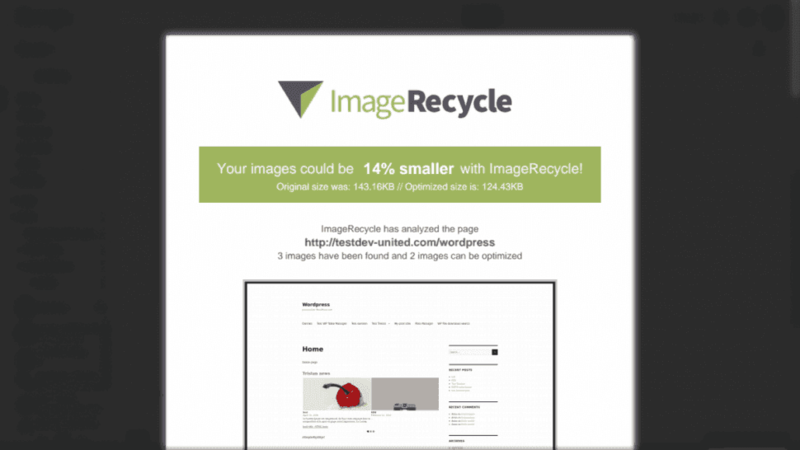 Optimizing your WordPress website’s PDF and media files with ImageRecycle is a handy and automatic tool to save server space. Nonetheless, the process could take some time, and that is where PDF reports come in. 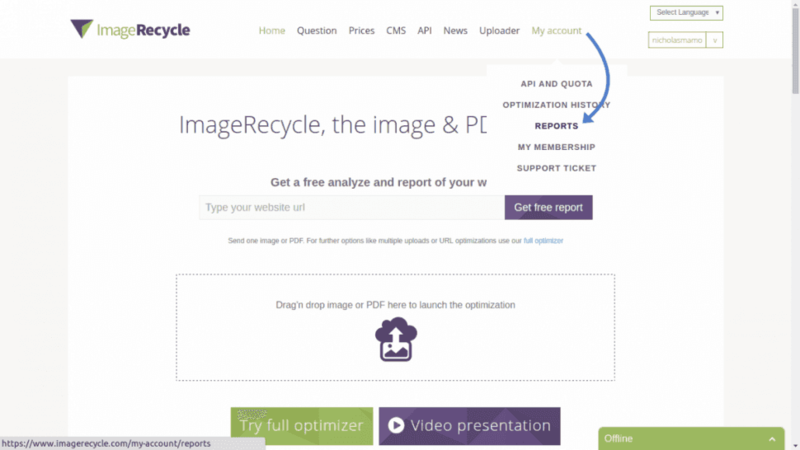 ImageRecycle’s PDF reports are a useful feature to give you a preview of how much your site could benefit from optimization... And they’re free! This section can be accessed from ImageRecycle’s website. Once you are logged in, you can head to the reports page from the My Account tab to generate a PDF report. The reports you create are sent automatically to you via email, and up to 20 reports may be saved at a time. The first thing that likely catches your eye is that there are two different types of reports you can generate - default and white label reports. The only difference between the two is that the former uses the ImageRecycle logo in the report. The latter, on the other hand, takes your logo as input, and uses it instead in the report. This would probably be your choice if you are generating a report for a client and want to emphasize your brand. Generating the report is a quick process. Firstly, enter the website whose report you want to generate. Then, if you want to generate a white label report, click on the White label tab, and upload you logo by clicking on the ImageRecycle logo. The final step is generating the report by clicking on Add report. The process takes around three minutes, so go make a cup of coffee and then check your inbox! The report is attached to an email seny by ImageRecycle as a PDF, and mainly includes information about how performant optimization can be applied on your website. The various infographics show you how much space you can save, how faster pages could load if you use ImageRecycle’s optimization on images and other documents, and which files would benefit. 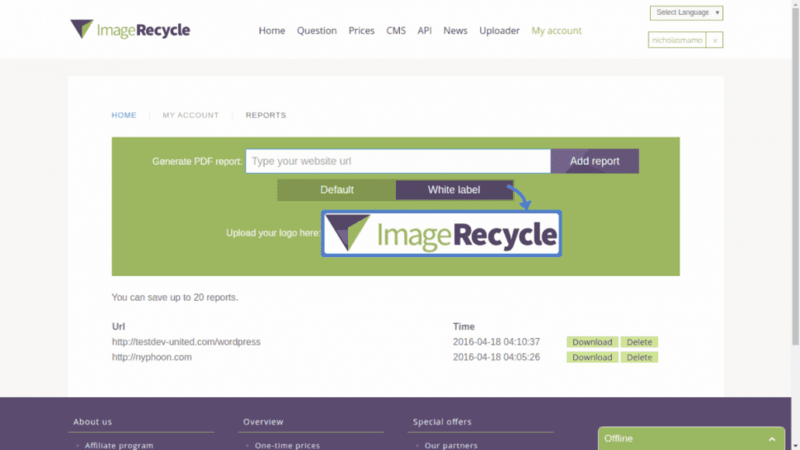 In addition to this, ImageRecycle’s report also provides information about the benefits of optimizing your files. 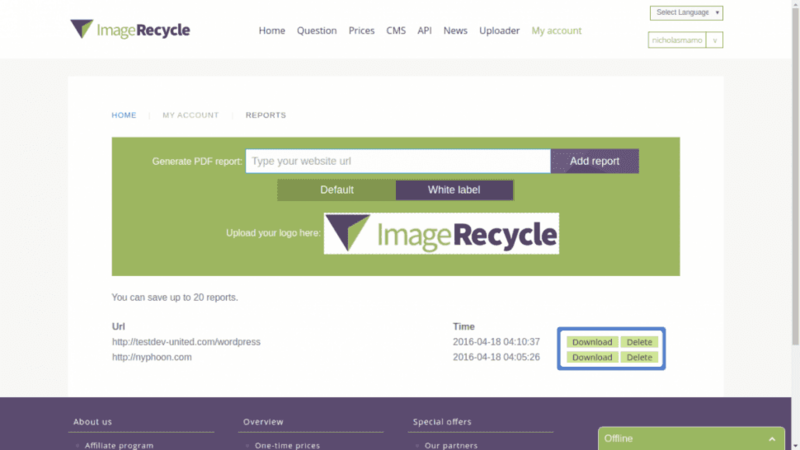 ImageRecycle also stores up to 20 reports for you on its website. This comes in particularly useful if you mistakingly delete a report and want to retrieve it. You can download your saved reports from the Reports page, by clicking on the Download button next to each file. Finally, keeping in mind that ImageRecycle has a limit on the number of reports you may have saved at a time, you can delete reports to make space for new ones from this same page. If you run out of space, all you have to do is click on a file’s corresponding Delete button to keep using ImageRecycle’s PDF report!